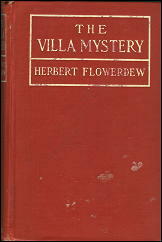 » Review: HERBERT FLOWERDEW – The Villa Mystery. Review: HERBERT FLOWERDEW – The Villa Mystery. HERBERT FLOWERDEW – The Villa Mystery. Brentano’s, US, hardcover, 1912. First published in the UK: Stanley Paul, 1912. 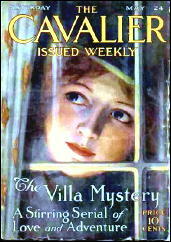 Serialized in The Cavalier, May 24 through June 21 1913. Also available online here and in various POD editions. Before I discovered this book online and in various Print on Demand editions, I saw the title and author in this blog’s recent checklist of “Serials from Argosy Published As Books” and found a copy of the Brentano’s hardcover edition without too much difficulty. For less than twenty dollars in fact, which is one heck of a lot cheaper than finding a complete set of the five issues of The Cavalier which it appeared in. Of course, it does me no good to brag about this, not when you can read it online for free. But should you? Can an obscure mystery or detective novel written in 1912 be worth the time and effort? My answer’s yes, given certain conditions, and I’m about to tell you why. The story’s definitely an old-fashioned one – how could it not be? – and if you have an allergy to old-fashioned stories, you might as well stop reading this review right now. It begins with a young girl, totally destitute, making her way to a former friend of her dead father, a wealthy man who has refused to repay a loan. But now that she has found the IOU, which had gone missing, she hopes to persuade him to repay his debt — but he refuses to listen to her, requiring her to return in the morning. He has no time to listen to her now. She leaves, but then returns to watch through the window of the study where she saw him earlier before entering once again, leaving the IOU and making off with a suitcase of money she has decided is rightfully hers. In making her way back to the train station, however, she is accosted by one man and rescued by another. In the way that the world worked back in 1912, the latter is the stepson of the man whose debt to Elsa Armandy has been repaid in such an unorthodox fashion. In another of the ways that the world worked back in 1912, Nehemiah Grayle is soon found dead, possibly a suicide (or so the butler claims) but more probably not. Compounding Esmond Hare’s deepening dilemma, for he believes the girl’s story (and she is most attractive) is that to remove her from suspicion means incriminating his own mother, now estranged from the dead man. There is a local detective in charge of the case, but it is on Hare’s shoulders that solving the crime falls. But this is a story of romance as much as it is one of detective work, with much missing of connections as the characters move here and there and do not stay where they are supposed to stay, mostly because of revelations and stories not quite believed or not told in timely enough fashion. And all the while staying out of the hands of the police, especially Elsa, but Esmond also, who fears he may say and reveal too much if he is questioned further. Delicious, I say. They don’t write stories like this very much any more. But what’s even better is that there really are some even more delightful twists and turns in the detective side of things, including a final explanation which is really quite clever, almost as clever as one found in the best of the Golden Age of Detective stories. It’s just a little awkward in the telling, I have to confess, and there are some even clumsier aspects of the clues and what the characters make of them earlier on, in their naively old-fashioned way, so it’s with these caveats that I do recommend you read this one. Bio-Bibliographic Notes: There are 16 books listed for the author in the Revised Crime Fiction IV, by Allen J. Hubin, but nine of them are indicated with a hyphen as being only marginally criminous. Herbert Flowerdew died in 1917 at the age of only 51. If he’d lived longer, perhaps he’d have taken this book as a stepping stone to a more significant mystery writing career, but that alas, we’ll never know. I’ll have to look this up. While they may not be classics and probably aren’t fair play in the sense we mean, many mysteries from this period have some appeal. As you say there is often much you have to forgive with books from this period, but they have a charm and grace of their own and can still entertain. Sorry, one more, once again Headon Hill. These are the ‘good’ reviews the publisher chose to try and sell the book! Thanks for providing my pre-breakfast laugh of the day! I’ve never read anything by Headon Hill, but now I think I must. The quotes were from THE TRAITOR’S WOOING by Headon Hill (available free on line) in which an evil Marahrajah schemes to have a young Englishwoman fall in love with an Englishman who will carry her away to India on the yacht THE COBRA where the Marahrajah can have his ‘way’ with her. Here the villainous Captain of the COBRA gets his comeuppance from Miss Nettle Jimson. Brant looked up at her, mouthing and gibbering; then he spat on the deck, and, turning away without a word, flung his Derringer over the rail into the sea. They don’t write ’em like this anymore — they wouldn’t dare! Discovering this one has made my day — and I promise it is real, not a MONTY PYTHON sketch or one of those sixties films like THOSE MAGNIFICENT MEN IN THEIR FLYING MACHINES with Terry Thomas. Not that I wouldn’t kill to hear TT deliver some of these lines. The Flowerdew sounds a good deal better, but it couldn’t possibly be this much fun. This book could be an entire chapter of GUN IN CHEEK. But lest anyone think that Flowerdew’s prose is anything like Headon Hill’s, let me reassure them that it is not — if reassure is the right word to use. They may have been contemporaries, but stylistically they were miles if not leagues apart. While reading THE VILLA MYSTERY both Edgar Rice Burroughs and John Dickson Carr came to mind, and for decidedly difference reasons — nor am I saying that Flowerdew is comparable to either of those two in storytelling ability. “Is prison worse than the workhouse?” she asked, and again Hare left the question unanswered. A sudden panic showed itself in her eyes as the fear suggested itself, and Esmond was glad that he could reassure her honestly. I didn’t mean to infer that Flowerdew was in Hill’s class (or lack of it). Just wanted to share the delights of Headon Hill as I just discovered them in relation to a contemporary. Truthfully, for every Headon Hill there were plenty of good writers from that period writing in the genre, but sadly, or happily, there are plenty of Headon Hill’s too. Flowerdew sounds to be one of the better ones and I’ll check this out. As for what the young lady meant by that line, the mind boggles. I assume it had a different meaning than the one that occurs to most of us (in context either to spirits or more likely courage), but I can’t say I’ve ever encountered it in quite this context. The only other meaning of the term I had encountered was an Australian one referring to a supply of food and other necessities carried by a traveler, and that makes no sense here. One more example of the vagaries of American and British English. I haven’t been this shocked since an English girl asked me to knock her up sometime. Boy was I disappointed to find out what ‘that’ meant. Thank you for a very interesting review! This author is completely new to me.